On the surface, the permanent signing of Florian Kamberi was a no-brainer for Hibs. He came in & scored seven goals in half-a-season & averaged 0.50 goals per 90 minutes (note: I don't include penalties when evaluating players & Kamberi slotted home two of those). That's an average of a goal scored in every other match. That kind of success made people quickly forget that Anthony Stokes & Simon Murray both actually played more minutes for Hibernian last season. Re-signing Kamberi was always going to be a priority for Neil Lennon - however, it's imperative for teams to examine the underlying numbers to make the best decision of how to spend their resources. 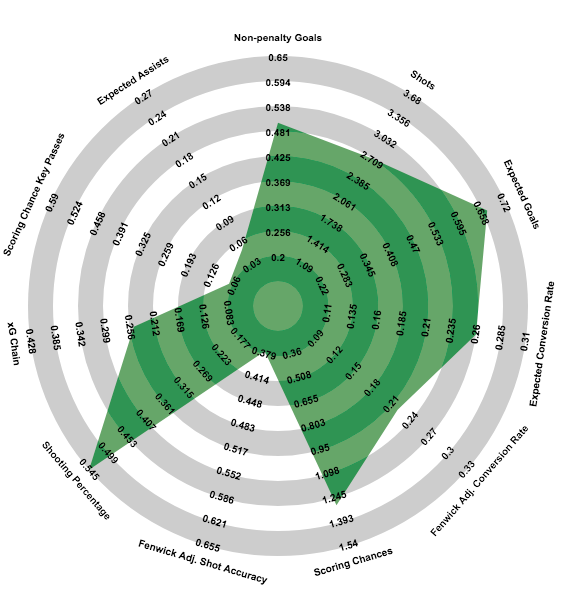 Given Hibs' openness to applying analytics to their recruitment process, I'm pretty sure that they did indeed take apart the data to see if Kamberi's form will be sustainable moving forward. The first place I look for seeing how sustainable a player's scoring will be is to look at his Shooting Percentage (Sh%). That measures the rate of shots on target that are goals. Typically, if a player scores on 40% or more of his shots on target, his finishing is bound to regress. Let's just say, there's a reason why Stuart Armstrong went from averaging 0.62 goals per 90 one season to 0.18 the next (hint: his Shooting Percentage went from 47% to 17%). Last month, I introduced Expected Shooting Percentage (xSh%) to better gauge the extent in which a player should see a spike or decrease in goals. This simply looks at the kinds of shots that a player got on target & applies the league average Sh% on those kinds of shots to determine what rate he 'should' have finished at. I then could compare actual Sh% with xSh% to tab players who would be due to see a dip in scoring & who you can expect to see more goals from next season (for the record - bet on players like Scott Sinclair, Lee Erwin, Moussa Dembele, & Simon Murray to score at better rates next season). Ummm...yeah. Guess what Kamberi's NOT going to do next season.....score on 58% of his shots on target. Now, like I originally wrote last month about Kamberi....it's not all doom & gloom. Yes, his Shooting Percentage is unsustainable....it just isn't - but, the good news is that his Expected Shooting Percentage is actually pretty damn good. If he finished at the league average rate, 37% of his shots on target would beat the keeper. Of the players who averaged more goals per 90 than Kamberi, only Odsonne Edouard & Jamie Maclaren had higher Expected Shooting Percentages. Quick side note....Florian Kamberi is not a playmaker. He is a goal scorer. Hibs teammate, Jamie Maclaren, on the otherhand was much more involved in getting others involved in the attack. He averaged 0.16 Expected Assists per 90, compared to Kamberi's 0.05 & averaged 0.40 Scoring Chance Key Passes per 90, while Kamberi averaged 0.07. Hibs next item on their to-do list will be to find someone to partner with Kamberi next season. The fact that 20-year old Oli Shaw averaged 0.12 Expected Assists & 0.35 Scoring Chance Key Passes per 90 in limited minutes should pique their interest...that & the fact he averaged 0.70 goals per 90 (with an xSh% of 41%). Oh yeah, I tabbed him last summer as the best young forward prospect in Scotland, so I may be a little bias here. Anyways.....back to Kamberi's radar. Two main things stick out that make me want to dig deeper. One is the fact that his Expected Conversion Rate (xCR) is pretty damn similar to his actual Conversion Rate. If your head's spinning with all of these terms....it's OK. Look at them as different entry points to understanding more about a player's performance. Conversion Rates simply look at what percent of a player's total shots actually beat the keeper. For the purpose of player evaluation, I only look at unblocked shots. Kamberi scored on 22% of his unblocked shots, while his Expected Conversion Rate (explained here) was 26%. This is a bit a head scratcher...he scored on 22% of his shots but his xCR was 26%???? That totally goes against the drastic difference in Shooting Percentages. What happened? Go back to the radar....look at his Shot Accuracy - it's among the very worst in the league. Of his unblocked shots, only 38% were on target. That's not good. His Shot Accuracy was only slightly better than Steven Whittaker & it's actually worse then Sofien Moussa (!!!!!!). This is where we can turn to the latest stat that I introduced last week - Projected Goals. It looks at what a player's goal rate should have been if they simply shot at a league average Shot Accuracy & Shooting Percentage for the different kinds of shots they took. For example, of Kamberi's 32 unblocked shots - if his accuracy was on par with the league average of the kinds of shots he took, he should have been on target 56% of the time. Instead, he was on target 38% of the time. Now if you apply his Expected Shooting Percentage to the Shot Accuracy rate he should have had - his Projected Goals would have been 0.47 goals per 90. In reality, his average was 0.50. You can see how extreme Kamberi's rates were on both ends of the spectrum. Compare his rates to teammate Jamie Maclaren. Maclaren is a player who is bound to see his scoring rates take a noticeable dip (if he hypothetically returned to play in the Scottish Premiership next season). His Shot Accuracy was beyond realistic while, even though he had a high xSh%...he's not going to score on every other shot on target. You may also notice that Kamberi's Projected Goal rate was actually higher than Maclaren's. Moving forward, that rate of 0.47 goals per 90 may be a realistic expectation for Kamberi next season...as his Shooting Percentage regresses (which it will), his Shot Accuracy will likely get much better than the rate he had last season. Meet in the middle & you still have a very good scoring threat. Basically the thinking is that Kamberi will get more of his shots on target which should offset the fact that he won't finish at the same rate he did this past season when he does test the keeper. If he does hit that goal rate of 0.47 next season, his scoring would be on par with that of Alex Schalk, David Templeton & Eamonn Brophy from last season. So, that was a long way of saying, this is clearly a smart signing by Hibs. When you consider the fact that at 23-years old, Kaberi is only now entering the prime years of his career & still has a good 6-7 years of upside left in his career. Hibs are investing in a player whose sustained scoring could lead to a pretty profit for the club. Plus, as you dig deep into the underlying numbers, the likelihood of him scoring at a pretty good rate is there. He may not average a goal in every two matches, but I think it's a safe bet that he'll come pretty close to that. The Modern Fitba Rating of Hibs' signing of Florian Kamberi? Stats used in this post come from my season long tracking of Scottish Premiership data. Next season, Modern Fitba will work off a unified set of stats. I usually include Scoring Chance data more prominently in player evaluation...but this blog post already felt way too heavy in terminology & numbers. But....this is another area in which Hibs can be very happy to have Kamberi back for another season. Only six players averaged more Scoring Chances per 90 (kicked shots from heart of the box & kicked/headed shots from within six yard box). Kamberi averaged 1.29 per 90, only Leigh Griffiths, Odsonne Edouard, Alfredo Morelos, Moussa Dembele, Scott Sinclair, & Jamie Maclaren averaged more. This is the third Rate my Transfer post. The first one looked at Hearts' signing of Steven MacLean, while the other one reviewed Aberdeen's signing of Lewis Ferguson. This was written under the influence of the Pretty Things, the Velvet Underground, the Cure & Waylon Jennings. I wanted to include this visual in the post, but it never really naturally fit. But you can see that we have the top goals per 90 rates from last season, alongside each player's Projected Goals per 90. My contention is that players will more likely score closer to that projected rate than their actual rate next season. Players like Edouard & Maclaren would be destined to see the biggest dips in goals (even though their Projected Goal rates are still pretty good). Dembele is the only player in this group who I'd expect to actually outscore his goals per 90 from last season & you can see that the differences for players like Kamberi & Alfredo Morelos aren't that noticeable. They are pretty safe bets to score at a similar rate in 2018-19.